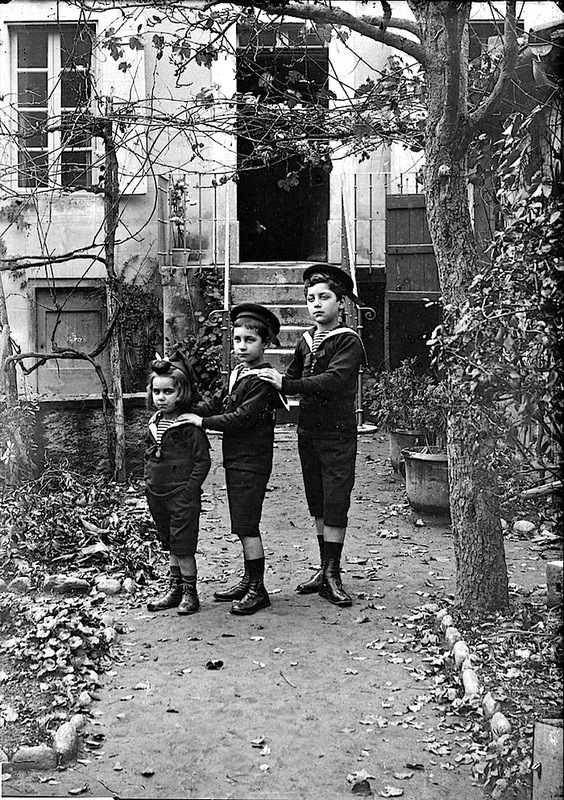 “Three children in sailor suits,” between 1859 and 1910, in the Pyrénées, by Eugène Trutat, via Bibliothèque de Toulouse Commons on flickr. I think the little girl has just about had enough. I like the way she has her hands in her pockets. There is another photo from the Bibliothèque that I believe shows the same three children, captioned “Enfants Servell, 2 novembre 1905,” here. For a minute I thought maybe it was a boy with his long baby hair. But you are right: That is definitely the same group in the other photo. Bet she grew up feisty and independent. It’s interesting what seems to be expressed about the three children in this photo. The girl is fierce (I wonder if she insisted on having pants with her outfit just like the boys, instead of a skirt? ), the middle boy is serious and a bit tentative, the one on the right is dreamy and is putting the most into posing. You can see something of the same characteristics in the other Servell photo, which I think was taken a year earlier. Children are children, no matter the century. The little girl is quite the defiant one, and she makes no bones about hiding it. I’d love to know her thought bubble. It may not be in “family newspaper” language. And her eyes are so dark, that I really wondered for a second whether she had painted around them.